Use the price comparison website search engine below to quickly find the cheapest car hire from Sotogrande on Spain’s Costa del Sol. Sotogrande is a very upmarket tourist resort situated on the Southern Costa del Sol in Spain. The resort is home to one of the most exclusive international schools in the country. The Sotogrande International School offers primary and secondary education for English speaking children. 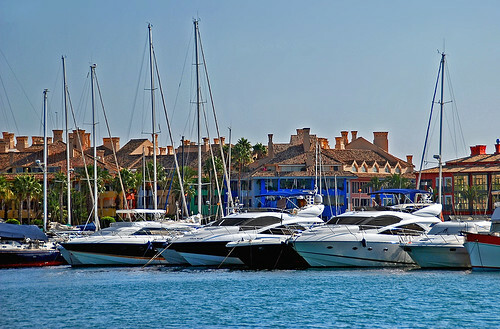 Sotogrande is known for its picturesque harbour filled with luxurious yachts, its beaches, golf courses and five star hotels. The main beaches in Sotogrande to visit are Cala Chullera Beach, Cala Manilva Beach, San Diego Beach, El Cabrero Beach, Torrequadiario Beach, Playa del Puerto Beach and El Cucurucho Beach. Sotogrande is also situated in an area of Spain with an over-abundance of golf courses which has been fondly renamed the “Costa del Golf”. Sotogrande is home to the famous Valderrama Golf Course as well as the La Reserve de Sotogrande, the Club de Golf La Cañada and the Real Club de Sotogrande. To the south of the resort lies the Alcaidesa Links Golf Resort, while to the north of the resort on the way to Estepona lies the La Duquesa Golf & Country Club. The weather in Sotogrande is so mild in winter that it has become an all year tourist destination where families with children come in the summer to enjoy the beaches and its golf courses provide the area with all the tourists they could need. Sotogrande is very close to the Spanish border with Gibraltar and only the seaside resorts of Santa Margarita and La Alcaidesa are closer to Gibraltar Airport. Sotogrande is a mere seventeen kilometres away from the nearest airport of Gibraltar while Malaga International airport is one hundred and eleven kilometres away providing a further gateway to Sotogrande and the Costa del Sol. On arrival at either airport, holidaymakers have three ways to get to Sotgrande which are direct transfer, taxi or car hire. Before arriving in Spain most people have a very good idea how they want to spend their vacation and depending on the location of their accommodation will make a choice whether to book car hire or not. Many of the hotels in Sotogrande are centrally located meaning that they are within easy walking distance to the beaches, shops, bars and restaurants. Sometimes apartments on complexes and private villas with swimming pools for rent are located on urbanisations with not a shop, bar or restaurant in sight making car hire more of a necessity than a luxury. A taxi fare from Gibraltar Airport to Sotogrande costs approximately €24 while from Malaga International Airport you can expect to pay around €122. It is wise also to remember that these taxi rates are payable on the return journey as well. Another option for people not wishing to drive themselves is to look at booking a direct transfer which often works out slightly cheaper than a taxi fare and has to be booked in advance. A direct transfer for a family of four from Gibraltar Airport to Sotogrande costs around £85.20 with Compare Airport Transfers and from Malaga Airport to Sotogrande with a shuttle company such as Simply Shuttles, you will pay €234. As there seems to be a limited choice to compare direct transfers from Gibraltar Airport to Sotogrande, it seems to me that catching a taxi in front of the terminal building proves to be a cheaper choice. Looking at car hire from Gibraltar Airport there are two companies with desks to choose from which is Niza and Avis Cars. Malaga International Airport is the fifth largest airport in the country and here there are a few more car rental companies to choose from which include Auriga Crown, Autos Lido, Avis, Europcar, Goldcar Rental, Hertz, National Atesa, Record, Sixt and Sol-Mar. One of the nagging worries I always have when I travel is regarding the question of petrol. We all want to book the cheapest flights and car hire possible and as some of these flights are very late at night, you would want to book a car rental which includes a full tank of petrol. Otherwise it could get tricky, especially if you have booked flights into Malaga International Airport – given the distance you would never make it to Sotogrande on an almost empty tank! If you have booked a car rental which includes a full tank of petrol you will be expected to return the car with the tank filled. There is a petrol station right at the entrance of Malaga Airport and less than a kilometre away from Gibraltar Airport. Try rent a diesel as they are much more economical. Expect to pay around €1.41 a litre for diesel. Not everyone can just rent a car, you obviously have to be old enough to rent a car, hold a valid driver’s license, have adequate insurance and bring the credit card with which you have booked your insurance. What is the minimum age to be able to hire a car? While there is no minimum age to hire a car, depending on the terms and conditions of the individual provider it is usually 21 or 25 years of age. What documents to I need to present on collection of the vehicle? The person serving you at the desk will need to see your passport and drivers licence, it is very important to bring these otherwise you will not be able to rent a car. As mentioned above they will also want to see the credit card that you made the booking with and sometimes make an imprint which will provide them with a guarantee that if you damage the car they have some way of billing you. On collection of the car it is important for you to make notes of any imperfections and point these out at the collection point otherwise you may be liable for the damage caused by the previous holidaymaker. What happens if I need to cancel my holiday and car rental? Most car rental companies will offer you a full refund while others will charge a small cancellation fee of around €20. Do I need to bring my insurance papers of my car at home? No you do not have to bring your insurance papers from your car at home, as part of the car rental agreement is made up of a collision and damage waiver, so you are covered for third party insurance. It is important to note that this insurance doesn’t cover medical expenses incurred in case of a crash which is typically covered by your travel insurance. You will be offered a chance to insure the car in case you lose the keys, damage the windows or tyres. Will I be charged for the distances I intend to drive? You can be rest assured that you can make the most of your holiday and explore to your hearts content, as all car hire companies offer an unlimited mileage! Will I be provided with enough petrol to get to my villa? Each car hire company will have their own policy regarding petrol. Some will include a full tank of petrol in the price of the car rental, while some will give you an empty car and expect you to return it the same way. It is up to the individual to choose the cheapest car hire, flights and accommodation to suit them and as mentioned before if you are arriving on a late flight choose a car rental with petrol included. If you do hire a car with a full tank and fail to fill it up you may be faced with a whopping fine which can be as much as €100. What if the car breaks down while I am on holiday? Every year the car hire companies will replace their fleet of cars with the newest models and in the unlikelihood of a breakdown a telephone number will be provided so that you will be able to make use of the free twenty-four hour breakdown service. Can I put another named driver on the rental agreement? As long as they have brought their drivers licenses with them and you are prepared to pay a small additional fee that shouldn’t be a problem. What happens if I receive a traffic fine while I am on holiday? The car hire company will take care of all traffic fines incurred but you may face a small administration charge of around €20. What happens if I return the car later than the agreed time on the rental contract? Most car rental agents will give you some leeway of a late return but if it is for more than a couple of hours you can expect to be billed for a full day, as the car then cannot be rented out again without notice. I am travelling with small children should I bring their baby and/or booster seats? It is easier for families with children who have enough luggage to cope with, to hire a car seat at Malaga Airport or at Gibraltar Airport, especially as low cost carriers such as Ryan Air will charge you anyway! Car seats can be rented from as little as €3 a day with a maximum of €42 for a longer holiday. Should I hire a GPS? Spanish maps and directions can often be confusing so a GPS can be very useful. Some of the more luxurious models that you can rent for a week will have a GPS as a common standard, otherwise you can choose to rent one from the car hire company or even in the U.K. and just bring it with you! A GPS can be rented from €5 a week to a maximum of €100 with a car hire company or from £15 for three days with companies such as Cheap Sat Nav Hire. Further optional extras that you may require could be ski racks, roof racks, roof boxes and snow chains (for the Sierra Nevada mountains). The important things to note when hiring a car, is to make sure that it has air conditioning, a must in the summer months, that you are fully insured for all eventualities and have breakdown cover – everything else is up to individual requirements. Some car hire companies will also charge you a credit card fee which can be avoided if you shop around! HOW MUCH DOES CAR HIRE FOR SOTOGRANDE COST? Looking at car hire quotes from Gibraltar Airport in the month of September you can expect to pay £197 for a two week period in a small budget car Kia Peugeot 107 and £747 in a 4X4 Toyota Rav 4 or £823 in a people carrier such as a Ford Galaxy 7. It pays to shop around and of course in the off peak season you will pay less and if you book a vehicle way in advance you will generally save money as well. At Malaga Airport in the month of July you can rent a Ford Ka for £217 for 2 weeks which includes a named driver as well. During the same period of time in the mid size range, ideal for families with children, is the Citroen C4 Picasso for £427 while a people carrier such as a Ford galaxy will set me back £1014. It is important to note that while these prices may seem high, they are for a two week period during the month of July. Of course there are also people who come to Sotogrande on holiday who haven’t hired a car and then will want to hire a car for a day or two maybe just to play golf or visit the nearby resorts of Estepona, Marbella and Puerto Banus. Gibraltar, Algeciras, Tarifa and Cadiz on the Costa de la Luz are also worth a visit. Page Summary: Hiring a car on holiday to Sotogrande is the way to go if you have booked a villa on an urbanisation and are flying into Malaga Airport especially if you want to go to the beach and make the most of your holiday. Even if you are staying in a hotel surrounded by restaurants and shops and the beach close by, it is nice to hire a car for a day and explore. Thanks you for calling me!! Thanks for the article, I found it rather useful! I go to Sotogrande every year on holidays, and in case it helps your readers I usually use taxisotogrande.com who have been great so far.